Have you ever heard of the “significant objects” project? As a literary & anthropological experiment, Rob Walker and Joshua Glenn wanted to see if they could resell cheap knickknacks (avg. cost $1.25) on eBay and turn a significant profit by adding personal stories to the item descriptions. The hypothesis was that emotionally charged stories would increase the perceived value of each object and therefore net a large profit on each item sold. To conduct the experiment they purchased around $129 worth of thrift-store items – like a ceramic horse bust or a cow shaped coffee creamer container – and had over 200 writers contribute rich, creative stories to attach sentimental value to what were otherwise mundane items. 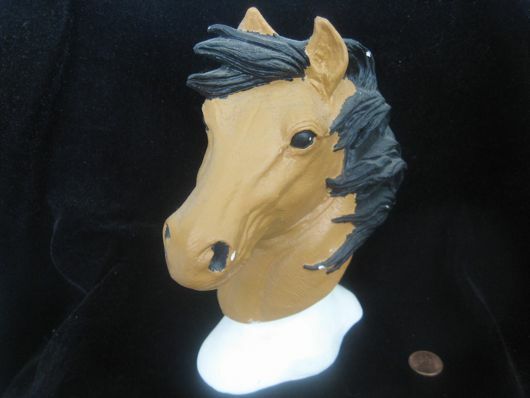 In the case of the horse bust, the item was purchased for .99 cents. The author added a (quite amusing) story about her father – the dopey drunk, hazing of exchange students in France during the 70’s and his disturbing experience with a horse. The horse bust resold for $62.95 – A 6258.58% increase! Each item sold at a similar profit margin & overall the project brought in nearly $8,000 combined. Absolutely incredible!! If your website isn’t converting, it’s likely the story you’re telling your customer’s journey through the marketing funnel isn’t resonating on some emotional level. Believe it or not, there’s actually scientific evidence to support why stories are vital to conversion process. In the 1990’s, Italian Neurophysiologist Giacomo Rizzolatti and his colleagues set out to study the neurons responsible for motor activities in Macaque monkeys. By implanting electrodes to the monkey’s brain, they could observe which areas of the brain were activated while the monkey performed various actions – such as grasping at a nut. One day, as one of the researchers reached for his lunch, he noticed something odd on one of the monkey’s monitors. 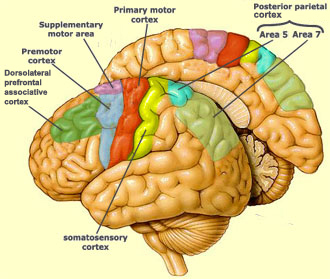 The ventral pre-moter cortex – or the area that would normally react to the monkey grabbing food – lit up. But the monkey wasn’t reaching for his lunch, he was just sitting there observing the researcher grab for his own food. This rocked the scientific community, because now there was direct evidence indicating that we do not use logical thought to interpret or predict the actions of others. Instead we feel them through what we would later discover to be a special class of mirror neurons. It turns out this phenomenon also occurs in humans. 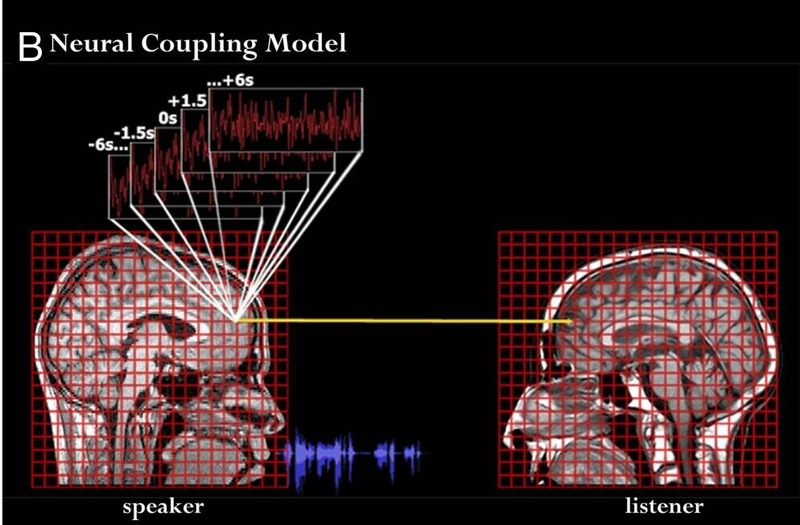 In a study by Uri Hassen of Princeton University, it was discovered that when listening to another speaker tell a story, the same areas of both the speaker & the listener’s brains would light up in an fMRI. Further research on mirror neurons suggests that many of these changes can last for weeks, months, or even years when reinforced through repetition. In a similar study, researchers in Spain found that written language that targets the senses or motor functions will fire off neurons in the corresponding sensory & motor cortexs in the brain. This is why just reading…“With his long nails, the boy proceeded to scrape down a blackboard.” makes most people cringe. 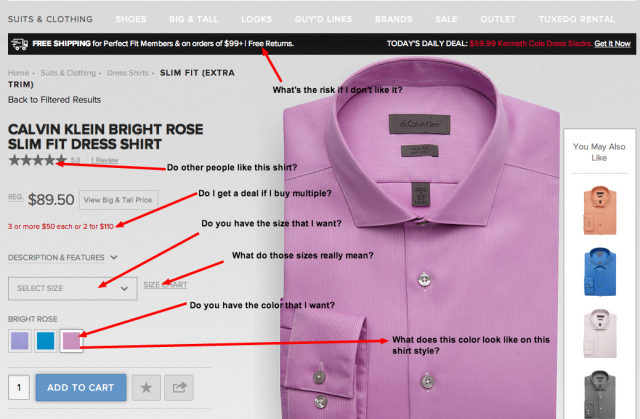 So, the question is, how does this apply to conversion optimization? 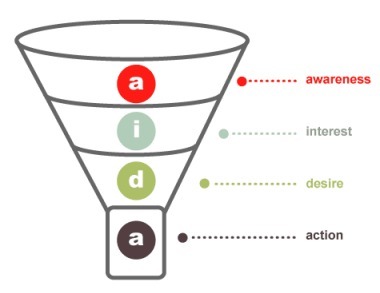 When you look at the marketing funnel from a storytelling perspective – each area of the funnel proposes different “acts” of your customer’s story. In this video, Men’s Warehouse is not only bringing awareness to the new collection but also showing you exactly the type of man you (or your boyfriend/husband) could look like if you buy into their new collection. Videos like this use very specific imagery to influence the customer’s perception and infer an outcome. For example, only 11 seconds into the video you see an image of a well groomed man – mid 30’s, in a perfectly tailored suit, holding what appears to be some kind of scotch or whiskey drink. Years of societal, media & social conditioning along with the principals of Gestalt psychology explain why your brain might automatically provide a backdrop, placing him at some high profile party or event where only the most influential people will be in attendance. Even though the image only appears for a brief moment in the video, several images like it transmit these stories to your brain to generate interest in the product. Watching the video, you may be compelled to think, “I should go check out their website” but you may also experience lingering doubts if you’re in the 23% of Men’s Wearhouse customer base that makes $30,000 a year or less. Landing on the website means you’re obviously interested, so they show you a stack of folded clothes, subtly implying what these outfits might look like on your shelf or in your closet. 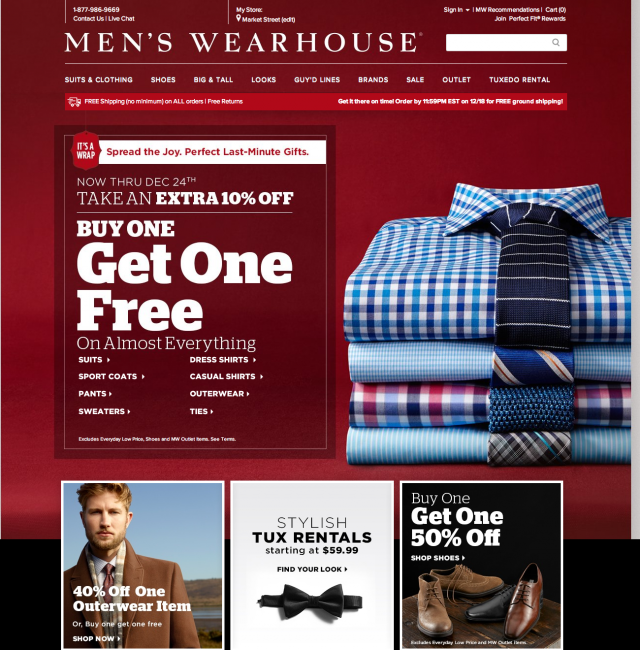 If you were worried about price, MensWearhouse.com also makes it very clear that it’s ok to shop with them given their clear “Buy One Get One Free (on almost everything)” and “Take and Extra 10% Off” offers. These offers give you the freedom to continue moving to the next part of the funnel. Desire – Do You Have What I Want & Need? Going a level deeper, on the product page, the various elements continue to let the visitor know if this page can fufill their needs. 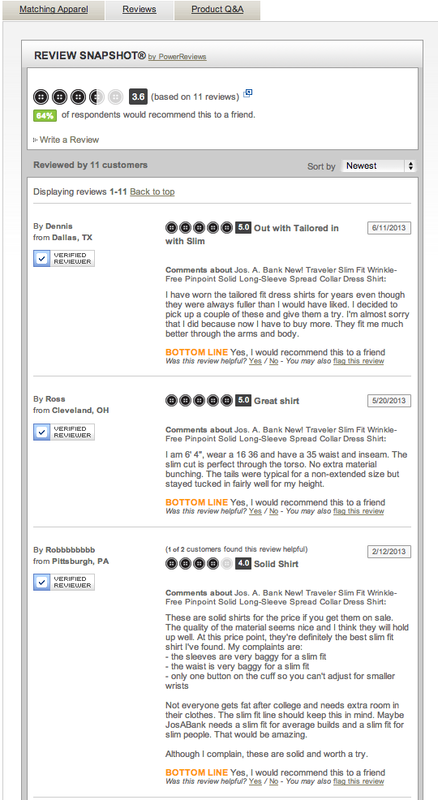 Understanding there is an internal story that has brought a visitor to this page, all of the different page elements – ratings, speacial offers, size chart, color options, etc. – are used to answer questions and combat objectives. 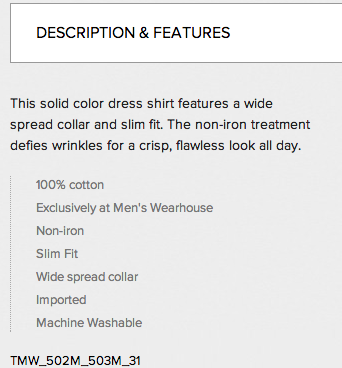 That’s important, because they do not appear to be arbitrary features for the page, but rather preemptive to help the multiple customer types who were drawn in by the initial narrative Men’s Warehouse was trying to craft around it’s brand. Sidenote: One thing I feel is lacking here however is attention to good copywriting & an emphasis on customer testimonials to better take advantage of the mirror neuron phenomenon. 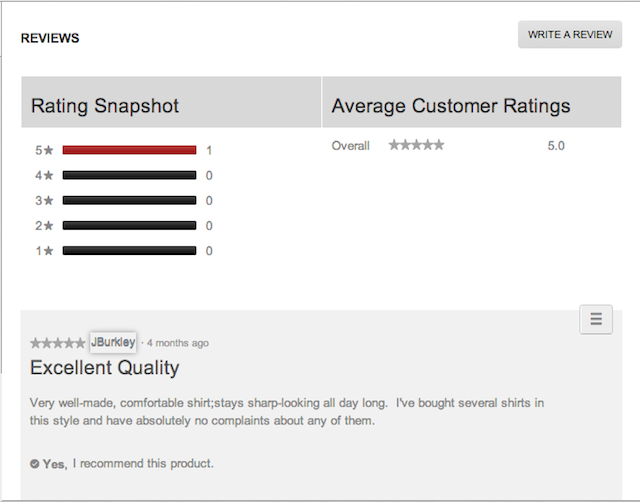 In spite of being a smaller company, and having (in my opinion) a worse web design, competitor Jos A. 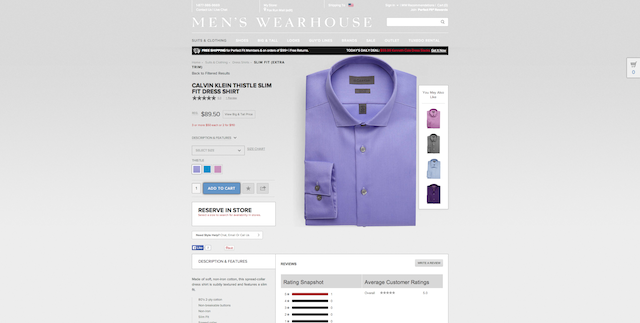 Bank beats Men’s Warehouse across the board for all online activities. Interestingly enough, Jos A. Bank appears to place a higher value on high quality copy & in-depth customer feedback while putting a priority out of making both more visible on the page. Perhaps if Men’s Wearhouse put more effort into collecting customer testimonials than an email with the subject “Thanks for your recent purchase” they could get better feedback? Afterall studies have shown that customers are 63% more likely to buy due to testimonials. It’s definitely something I’d investigate if I were Men’s Warehouse. Anyways, on to the next step. 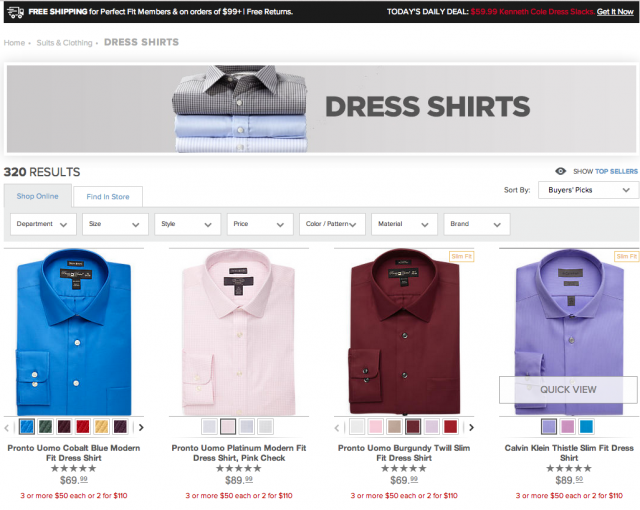 Action – Does Men’s Wearhouse Make It Easy To Complete The Story? 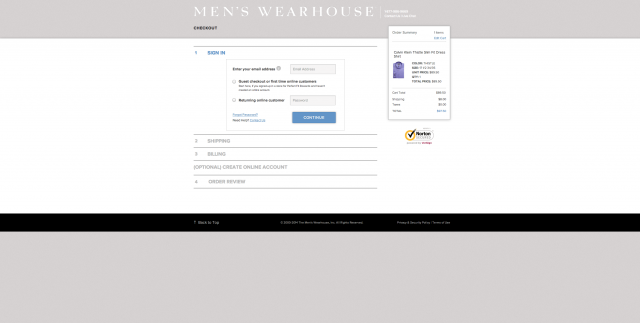 After clicking “Add to Cart” they use a persistent shopping cart so you can see all of your items & the full checkout process is anywhere between 5-9 clicks, depending on whether or not you’re a registered user. My only gripe here is that when you get to the “create an account” step in the checkout, there’s no real incentive to become a registered user. However, by the time I reach this page the interest & desire have been built up so much that there is very little holding me back from completing the action Men’s Warehouse wants me to complete. 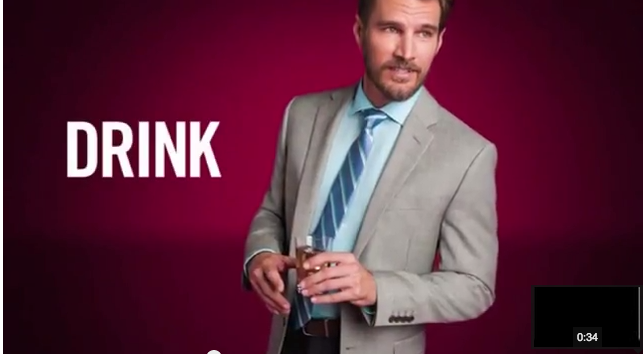 In my opinion, Men’s Wearhouse told me a story about what I’d look like & who I might be. They made the conversion happen long before I ever reached the checkout page. Everything else was just about removing friction to get me to buy. If you look at consumer behavior as a story, you realize, for them, it’s all about experience. Not just a good experience, but also a targeted one – and the experience should promise an outcome that can only be had if they buy your thing. Take the humorous video from Point of Sales app Clover, for example. It pokes fun at all of the different jobs you as a small business owner does just to keep your business running- and let’s you know you can “fire” all of those different versions of yourself if you get Clover. Using narratives to create memorable experiences is vital to the sales process, because you need prospects to remember you when it comes time to solve the problem. Let’s talk a little bit about how that works. If only the sales process were so neat that everyone would get up and buy our product as soon as they saw the first piece of marketing. Realistically, you wouldn’t buy a Clover P.O.S if you felt like you had a perfectly functional system. It’s not until you’ve become truly overwhelmed, something in your system breaks, or feels outdated that you might consider something new. 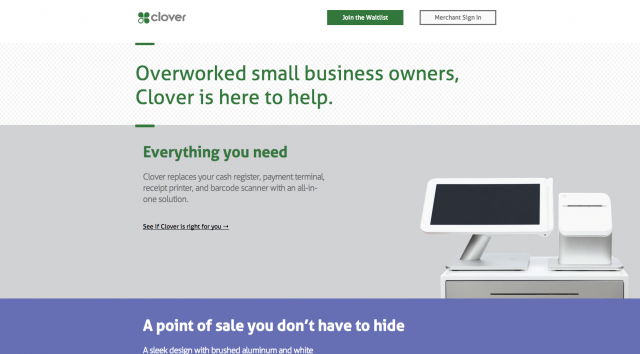 At which point, Clover hopes their commercial, website, re-marketing efforts & advertising frequency were memorable enough be the first thing you remember when the time comes to solve that problem. Customers experience so many things in a day, that only a handful can actually become memories – which is why it’s vital that at every opportunity you’re creating something worth remembering. When constructing a marketing funnel, it’s important to know how the human memory works so you can create content & materials that are best suited for each part of the memory making process. 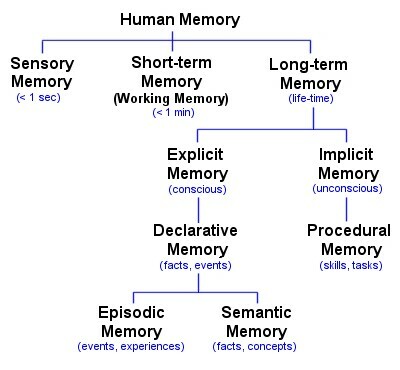 The process of human memory can be divided into three parts: Encoding, Storage and Retrieval. For new memories to be stored into our brain, the information first needs to grab our attention for the brain to even want to translate it into neural code. Encoding is a biological event beginning with perception through the senses. The process of laying down a memory begins with attention[…]in which a memorable event causes neurons to fire more frequently, making the experience more intense and increasing the likelihood that the event is encoded as a memory. Now, think about the last movie trailer you watched. How did they use sight and sound so that movie would leave an impression and compel you back into the theater? The nice part about encoding is that it can be hacked. The reason why 98% of action movie trailers use fast edits, lens flares, gratuitous explosions & an orchestral soundtrack is because that tells your brain it will be similar to other good action movies you’ve already seen. By packaging your content with “familiar” elements, you allow your customer’s brain to easily say yes and move on to storing the information. Without that, their brain has to subconsciously decide “do I want to do extra work to remember this?” and usually, the answer is no. 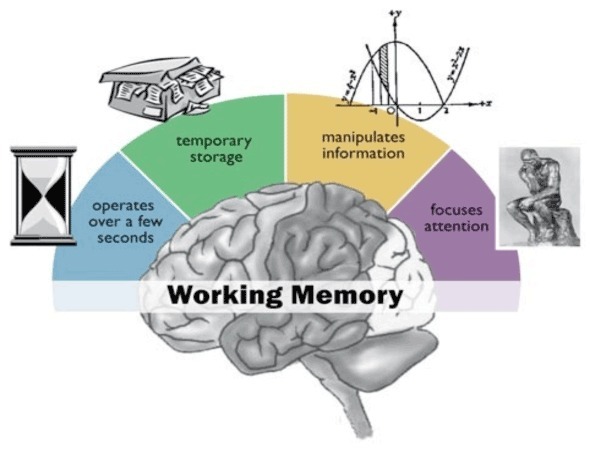 The short term, working memory stores between 5-9 items for around 30 seconds. The idea with your storytelling and marketing is to give the working memory just enough information to decide what to do with the offer. Should they act now because the sale isn’t going to last long? 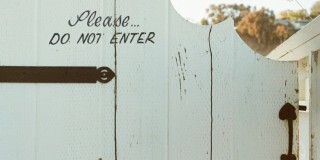 Should they keep you in mind when the need arises for the thing you offer? For the most part, this is the part of the brain you’re trying to communicate with the most, because it’s the working memory that decides whether to respond immediately to something or file away for later. Information that does not get encoded is not remembered, period. This is why it’s so critical that your messaging is memorable & reinforced. Long term memories are retrieved through both association and repetition. Going back to the Men’s Warehouse video from earlier, even though the message contained several cues to let me know “you’re going to like the way you look” a single advertisement is not likely going to be the sole motivating factor in my purchase. 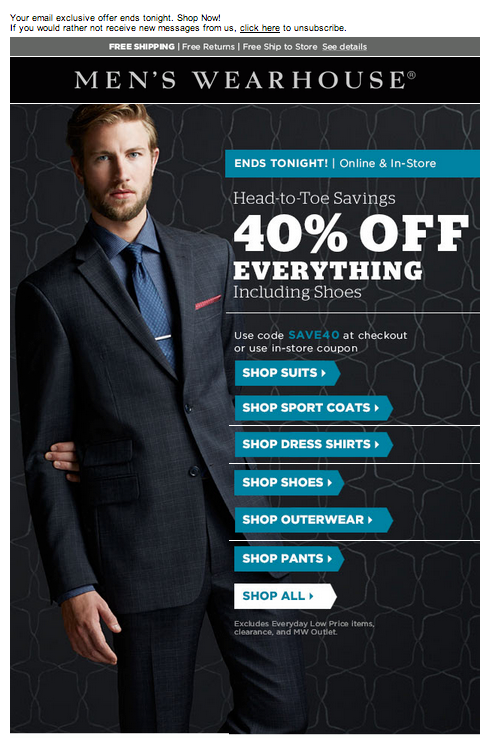 That’s why there is such a strong focus on converting visitors to email subscribers, so they have the opportunity to remind you, repeatedly that “Men’s Warehouse = high fashion & tolerable prices. Converting short-term memories to long-term memories require synaptic changes in the brain which requires time, frequency & some degree of habit formation . This time dependent process is called consolidation. It’s a lot of work, but once the information enters the long term memory, it is resistant to interference or disruption from new stimuli. The brain is a complicated place, but understanding how it works can help you to develop comprehensive, long-lasting strategies that are appealing on nearly every level. Creating marketing experiments to keep your customers’ brain engaged throughout makes the entire “conversion” process more intuitive, connected, and visceral. Ankit Oberoi is a co-founder at AdPushup, a startup focused on helping publishers and bloggers optimize their ad revenues. You can reach him on Twitter @oberoiankit. Wow! What a post I loved it, thanks Ankit! The introduction story was great learning how they made over $8000 on Ebay. Glad you liked the post. Tommy (Editor of ConversionXL) has also worked hard on this one. Thank you for pointing out the twitter link, it has been fixed. That’s why TED Talks work so well. Really awesome article! This has given me more than a few ideas for creating content that is story-based. In fact, now that I think about it, “I remember” having great success in the past with content where I simply told a relatable funny story to hook interest. Very nice and thorough post. Thanks for sharing your information. When I first came across conversionxl.com I was skeptical… My head was already throbbing with pain, overwhelmed with too many sources of information. The stress of running out of time and cash was bearing down on me like a weight – I needed help if I was going to reach my goal of making more money. So, I subscribed and at first nothing – then it happened! I read about an idea so simple yet effective – it made my skin tingle with excitement! I was a fool in the dark writing copy nobody would read, now enlightened with the secrets of storytelling I’m selling more then every before! Thank you conversionxl.com. You should rename it to The Science of Writing a Good Post. Absolutely fascinating! What a well-documented and meticulous article. The beginning reminds me of the visualization vs simulation debate re: understanding stories (simulation seems to come out on top). Thanks for such a great post. Excellent material. I see many parallels for classroom in our article. It seems advertising and teaching have much in common, when performed well. 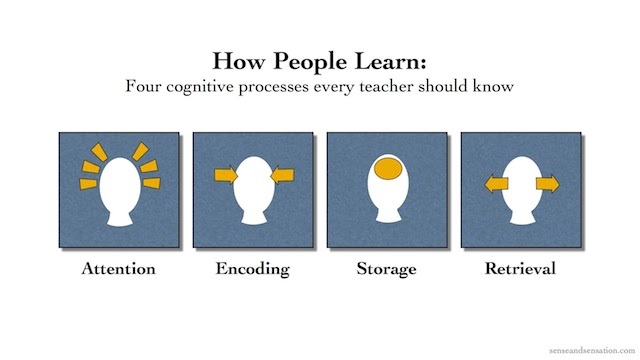 The remembering and retrieval have always been part of traditional schooling. I think what we are challenged with in Computer Science is creating the desire to always learn. The action of being vulnerable and pressing on is a skill many are uncomfortable with and it needs to be mastered. Perhaps in advertising it is the customer who fears an expense or making a wrong choice. The willingness to learn effectively from failure is not natural. This is a great and enlightening post: Your tie-in with the Men’s Warehouse clip at 00:34 gave me insight into why those moments have such power! And the initial story (or research findings) was great proof that storytelling works. I’m in the UK so lack of familiarity with the brand will influence, but I have a very different reaction to you about the Men’s Warehouse shopping experience. Landing on their website breaks the spell the video wove me into. It’s not emotionally engaging, impersonal and they’re not reinforcing the ‘look’ and lifestyle they sold me; only that their clothes are ‘cheap’ and they ‘pile high and sell ’em cheap’ (due to the 2 for 1 on almost everything). I can’t help feeling depressed when I see how those fascinating inputs from psychology and neuroscience are imediately turned into weapons of mass manipulation. A worthy read, though: the better we know how they’re trying to influence us, the better we can resist. It’s a very interesting article, currently i am working on the use of memory in story-telling for my Ph.D dissertation, your article inspired me truly…thank you.